Marjorie Moore and Natalie Jablonski explore nonprofit life in the place where mission and people meet. After all, we’re all working toward the same outcome. It's the 100th episode of 501Crossroads! We drink champagne and eat cake! And we talk about knowing when it's time to make a change or move on to the next thing. Plus- a related announcement from Marjorie and Natalie. Don’t forget to leave us a review so we know how you’re making your mission happen! Do you ever see another organization get a huge grant or fantastic volunteer and have that bring out the big green monster in you? Natalie and Marjorie talk about how to handle jealousy in your organization and in yourself and how to make a strategic personal plan. A few weeks ago Marjorie and Natalie grabbed the wine and talked about what candidates need to stop doing when applying for jobs. But there's a flip side. Hiring managers and HR people are doing some sketchy and shady things that need to stop today. Find out more in today's Wine on One. Imagine a world where your nonprofit had all the money you needed for marketing and the right people were receiving the messages you wanted them to get everyday. Jessica Thomas lives in that world and can help you transform your marketing. Jessica walks through the world of Google Grants, an easily obtainable way to get $10,000 of inkind gifts from Google, and their AdWords program. She explains how setting up remarketing campaigns can help you remind donors to purchase event tickets AND breaks down the difference between a Boosted Post and an Ad on Facebook. To get in touch with Jessica and information about working with Amplified Digital at Amplified Digital's website, by email at jthomas@ad-stl.com, or phone at 314-475-1237. It's the little things in life that can make a huge impact. Ty Vanatta knows that first hand. After a rough childhood, being actively against reading, getting in trouble, and nearly landing in jail, he turned his life around with the help of a mentor. Today, Ty is sharing the wisdom of his mentor, Tom Pace, author of Mentor the Kid and the CEO-A Simple Story of Overcoming Challenges and Achieving Significance. From the little things you can do everyday to make your life better to the list of books to make you a better person in business and life, together Ty and Tom are making the world better one mentor at a time. Marjorie and Natalie loved this book and know you will too. Go get it today... or get one for everyone you know! Contact Ty at 405-752-0940 or on Facebook or on Twitter. A difficult coworker or boss is the main reason people move on from organizations. But there's always that one person that makes our life difficult. Pam King from Our Community Listens asked, "What if we tried to change the way we deal with people before we change jobs?" According to Pam, "It starts with the person who wants the change...and that's us!" That doesn't mean we need to become a doormat for difficult people. Pamela walks us step by step through how to create transparency, mend relationships, create change, and become more productive. Connect with Pam by email at pamela.king@ourcommunitylistens.org or on LinkedIn. And be sure to check out the nationwide programs Our Community Listens Provides at https://ourcommunitylistens.org/. When was the last time a car cut you off, only for you to realize it was wrapped in your favorite charity's logo. Or you witnessed someone being rude to a store employee while wearing (gulp) the tee shirt from YOUR fundraiser? There's a lot to think about when it comes to nonprofit branding and not all of it is under our control... especially if you give out a lot of swag. Marjorie and Natalie grabbed some wine to talk about the ramifications of boarish employees on social media, rude donors in the community, and bad drivers in your organization's cars and what you can do to protect your brand from them. If you don't work at an organization that doesn't specifically work with people with disabilities, you don't have to worry about making your fundraising events accessible, right? As our guest Christy Herzing from Paraquad says, "Making your event accessible speaks to a level of inclusion that can increase your donor base." That's something we all want, right? Christy was joined by her colleague Sandy Jones also from Paraquad to talk to Marjorie about what basic accessibility accomodations you should look for in planning events to save yourself time and trouble in the long run and how to think outside of the box to make sure that all of your guests feel comfortable and welcome. Connect with Christy at cherzing@paraquad.org, on Facebook, on LinkedIn, or by calling her at 314-289-4264. Connect with Sandy at sjones@paraquad.org, on Facebook, on LinkedIn, or by calling her at 314-289-4274. Marjorie: 00:02 Welcome to 501Crossroads, your show all about nonprofits and the people that make the mission happen. I'm Marjorie Moore, President & CEO of MindsEye and my personal mission is to make nonprofit stronger by identifying and fixing the rubs that so often come up between people and the mission. Natalie is at the dojo again today. Marjorie: 00:15 She's taken a lot of days off here for training, but I am excited because today we have two guests in the studio with us. We have Sandy Jones who is the community relations and events coordinator for Parquad here in St. Louis and Christy Herzing, the community access coordinator, also at Paraquad. Sandy, Christy welcome. Sandy: 00:38 Thank you for having us. Marjorie: 00:39 So Sandy tell us a little bit about you and what you do at Paraquad maybe introduce Paraquad a little bit because I'm going to guess most of our listeners are not in St. Louis and have never heard of it. Sandy: 00:49 So Parquad is St. Louis a center for independent living. We work with people with disabilities to empower them to live their lives as independently as they choose. I have the privilege of planning events for Paraquad. So I work, ah, we have several different events throughout the year every year though you're pretty much guaranteed to have our Shine the Light Gala and our Ramp Up for Accessibility Day which actually just happened yesterday. Marjorie: 01:13 Awesome. And Christy, what about you what do you do there at Parquad. Christy: 01:16 So I am the community access coordinator and I manage our Accessible STL program. And so through our Accessible STL program we're working with businesses and organizations to provide a site survey so we're looking at their facilities and determining if they are accessible based upon the Americans With Disabilities Act standards and then we also provide training and education on being more inclusive for people with disabilities as well as. A whole lot of other services just for businesses that want to be more inclusive, consulting, you name, it we kind of do it on the business end of things and we also have what Sandy's talking about with the events. We also have a training on how to make meetings and events more accessible. Marjorie: 02:07 It's awesome well that is why we are here today. One of the things that I hear probably way too often when about community talking to other exec directors or event planners who aren't in an organization that is specifically serving people with disabilities. They'll say well, "there's no blind people coming to my event or there's nobody that's going to be in a wheelchair or all of my guests can hear perfectly fine, like why do I need to do this" So why is it important for events especially fundraising events to be accessible in the first place? Christy: 02:40 So it's important for them to be accessible in the first place because you don't know who's coming in the door, so you don't particularly fundraising events. You don't know who that next donor is going to be or who that donor's family member is going to be. Christy: 02:58 So to be accessible and to think about that from the beginning because if you don't think about accessibility from the very beginning then if you wait for someone to ask for an accommodation then you could find yourself in a spot where someone asks for "I need this accommodation because I use a wheelchair," and oops we have picked an event location that doesn't have an entrance with a ramp that is accessible and then all of a sudden we're trying to figure out what we need to do. So thinking about accessibility from the beginning is very important but also making your event accessible is it speaks to a level of inclusion that then can help increase that donor base because donor bases are aging as well. And so that's very important to keep in mind as well. Marjorie: 03:49 I guess the other thing is that I guess we have we have this picture in our mind, I think sometimes of a younger person that has a disability. But I think the one thing that we all know since we all work in that field is a lot of times it's our friends and our donors who have been with us for years maybe that donor giving you $25 for 50 years, well look, they're 70 now and maybe there's a mobility disability and maybe hearing's not so good anymore. Sandy: 04:17 Kind of aging into that disability and what does that mean moving forward. And how to make something inclusive for them as well. Marjorie: 04:24 So let's talk about some horror stories or some not to do is what have you guys seen out there it. And we've all been there. I'm going I'm going to it right from the beginning. I've screwed this up. And like I mentioned you know we work with people who are visually impaired at MindsEye. But you know we we screwed it up a couple of years ago we had a table full of people the varying levels of vision and they were supposed to be served first at our gala. And for some reason the people set out the buffet food and then the rest of our guests just decided to get up and get all their food before all the things. And so our guests had no idea that there was food there. The other problem that we had actually that year too was or for some reason our wait staff didn't think to specifically ask our guests with disabilities if they wanted the food that was just being passed around on trays. So we've since trained them. So what if you guys heard or seen? Sandy: 05:27 So I'm going to give a couple of examples from my own personal experience. They've both been events with Paraquad. So I mentioned earlier our Shine the Light event. It is a large formal gala this past year took place at the Ritz-Carlton. And we do everything we can to ensure that all accommodations are met. We are very open in the beginning, "Hey if you need the accommodation just email Sandy she'll take care of it." And we do that and we account for absolutely everything and then we add in some cushion and know that there may be people who didn't tell me or things that I already know because we have a good relationship with them all that kind of stuff. So we had a guest who was deaf and needed sign language interpreters we always have sign language interpreter at our events. Sandy: 06:17 That's no big deal. We have one on stage to interpret everything that's happening on stage. And then we also have one at the table for table conversations during the event. We had set up the camera and everything to have a picture and picture show so that when the let's say the screen is got like a video on it showing the person who's on stage there is a smaller picture on the bottom that has the interpreter visible. So it's two different cameras. Both of them are on the same screen. So we get the first of the evening started and our interpreter is in the dark. They're up there. They're interpreting. There's a camera on them but the camera is not completely focused on them and the interpreter is in the dark. So our guest who is deaf could not see the picture on picture screen of the interpreter interpreting. So I had to kind of run around get our production crew which was fantastic and they got on it right away. They started playing with the camera as they started playing with the lighting they started playing with the the mark where the interpreter was supposed to be standing. All of that was going on. I had to go over to the table where our deaf guest was sitting and say hey let me have this interpreter interpret for you...Can you see the interpreter because the lights are low because the screens are on. Can't see the interpreter at the table so I have to turn the lights up so that that person can see the interpreter sitting at their table. All of this sounds really long and probably for less than five to ten minutes, by that time everything was fixed. But at the time it definitely felt like oh my gosh how do we make this happen? You know we had everything set up right. It was going to you know it should have worked out great. But there are just like minor cues so now we we work to get our interpreters there a little bit earlier so that we can make sure the camera is focusing properly on them and make sure that everything will be good event. Sandy: 08:13 Because a lot of times interpreters will switch out onstage because they get fatigued so kind of make sure that our camera is set up for both of the interpreters who will be switching out all night and make sure that everything is taken care of in that way. Sandy: 08:25 So that's that's one of one of the ones that we've had recently and another one was we had a foreign film. We had some guests from out of the country. They brought some films with them and they had subtitles on them. So we're like OK great there sound there are subtitles. Everything's great. We've taken care of everyone's needs. The sound was in a foreign language so our guests who were blind or low vision were not able to hear what was being said. Sandy: 08:53 So we were able to get a couple of our staff to go and sit next to people and kind of read the subtitles to them as well. But that was another one of those like, oh my gosh how do we fix this? I can't believe this just happened right now. And those are definitely both learning moments to make sure that we're addressing those kinds of issues too. Marjorie: 09:11 So for all of us out there feel feel OK the pros get it wrong too. So what I do after that is is learning and trying and making sure that like you putting forth the effort and you're trying to think about in advance and when you get it right, it's so much better. Christy, what have you seen? Christy: 09:27 So as someone who has a visual impairment the things that Sandy was just talking about the last description that she was talking about, I go to a lot of conferences and things like that. And a lot of times they will play videos up on the screen and there will be words that are put out there and they'll have closed captioning for people who are deaf or hard of hearing but a lot of times are messages that are on the screen that are put into words and they're not spoken. And so when we can't see that, we don't get nearly the same message that everyone else gets. A,, couple of other things that I've seen. I've been to many different national conferences and tends to be that disability is forgotten about. And I went to one where the venue was more the issue than anything else there was it was a conference for a program that mostly people with disabilities were running and they had two small elevators that got you up and down to anywhere in the hotel. And so for people who were using wheelchairs it was never ending, all day process to get up and down the elevators. So things like that, you know ,that really everything has to be taken into consideration and everybody gets it wrong, occasionally and it's OK to get it wrong as long as you learn from it in the process. Christy: 10:55 But it definitely that was like one of my first conferences I ever went to, and I mean I only knew so much about accessibility at that point, and I went, "Wait, what? How did this happen?" It was it was definitely a moment where there were a lot of people saying. "How... what are we supposed to do now." I think one time the elevators got used so much that the elevators actually stopped. Christy: 11:23 It was just that bad. Marjorie: 11:34 No that is not good.So let's talk a little bit about what are some some best practices you know from from right from the beginning to let people with disabilities know without being like Hey!!! That you're accessible so that if somebody is coming maybe with their spouse that's having some hearing difficulties that they know that, oh OK, it's going to be alright or if they know they're going to have a walker. They know that they're going to be able to get out. What are some best practices to let people know so that maybe they don't have to like shout and say hey I need help. Marjorie: 13:03 And that actually may even help people who have had transplants or things like that or people that have different food needs even now. It's not necessarily disability, but definitely somebody that might need a little bit of a little bit of different help. So it's always good. And you know the more people that you can bring in the better right? Marjorie: 13:22 So let's talk about specific things to accommodate maybe some different disability. So what would you recommend if you knew that you were going to have somebody who was low vision or blind at your event. Christy: 13:37 So the first thing I would recommend is and we say this all the time, and you'll hear this recommendation come from us all the time is when a person calls you and tells you they need an accommodation because of a specific disability. The first thing you want to do is make sure you ask that person what they need, because certainly for someone who is blind or low vision, you want to make sure you have alternative formats such as large print and braille or being able to offer those formats and anything that you have in an electronic format. But what that person's individual needs are may be very different. So a good example of that for this particular group is I was once at an event, and another one of those horror stories at an event and given some materials. So I have no vision in the right eye and then very limited vision to my left eye. And so I was given basically a legal size piece of paper with the font was like Arial Bold 36 and it was something that someone else was able to use. Well but for me I can only see about one letter in my vision. So it was not even usable for me and I was not asked what works best for me. So that's number one is making sure that you're asking. Number two for people who are blind or low vision, alternative formats are the top thing. The other thing that I would recommend is if they need assistance. So if they need any assistance navigating this space making sure that you have a volunteer maybe from your organization or volunteer that's working that can help them navigate. Do you have anything you want to add? Sandy: 15:28 I think that's true of pretty much any kind of disability really because the same thing to be said of a person who is deaf or hard of hearing. It's not every person who is deaf or hard of hearing uses American Sign Language. Not every person who has ever heard of hearing can read lips. So it just kind of depends on each individual and what they want the same as for a person who uses a wheelchair. Some people who use wheelchairs would like to transfer into the same chair that everyone else is sitting in a dinner rather than having the chair removed for them. Some people who use a wheelchair cannot transfer and so they would like to wheel up to the table in their chair. So just always trying to find out what that individual wants and providing it for them, but also being flexible that if you have provided something that is not what the person needs to find a way to provide what it is that they do need. So for the person using a wheelchair example, it's very simple. Either grab a chair or move or move the chair away from the table. Very easy to help accommodate that. It takes a little bit more planning for something like Christy was talking about because if you need it in an electronic format you have to make sure that you prepared that ahead of time, if you need it in Braille. You also have to make sure you prepare that ahead of time. Marjorie: 15:28 Braille, a lot more, you have to get that program done a week before! Sandy: 16:48 Yes exactly. So that is the key for just about any accommodation is listening to that individual's needs and not assuming that you know what's best because you happen to have a friend who is also got that same kind of disability. Sandy: 17:33 And there are a lot of different sign language modes. So not everyone uses American Sign Language. I don't know all of the different sign language. I believe it's called a mode. But not everyone uses American Sign Language even if they do use some form of sign language. So like when you're getting an interpreter, you want to make sure that you're getting the right kind of interpreter. We have interpreting services at Paraquad. And so for most of our events we do need ASL but our interpreting services have several different languages available depending on what a person might need at any given time. Sandy: 18:12 It's just it's just like spoken word there and there are different dialects as well. Marjorie: 18:17 Yeah. So let's you know try to kind of do some brainstorming so that people kind of know maybe what they should be plan planning for. Again, always want to talk to the person. But let's say that you know your former Board Chair has had its back issues she is she's using a walker. What things can you do in advance you know to to get ready for her to be at the event. Sandy: 18:45 OK I'll go. So one of the big things especially in that is clear paths of travel, making sure there's enough space for people to easily navigate. Also anything that's one level, you know if the bathrooms are all on the same level as the event, if you don't have to go up a single set. A lot of times I notice even myself I notice a lot more now since I've started working at Paraquad and working specifically on making events more accessible. They'll be one step into a room and you don't even realize it because you can walk up that one step but not everyone can. And so if from the get go you're like OK everything's I be on one floor. There's not going to be any steps involved. The restroom is going to be same floor same level no steps involved in that. I'm going to make sure my tables are wide enough to accommodate someone who's using a mobility device to get between tables. Sometimes that gets a little hairy because especially for non-profits at fundraisers you want to stuff that room as full as possible. But you know make a little space that everyone can get through all the different aisles. And then also having chairs available you know if you have a cocktail hour that's great, but maybe have some low cocktail tables in there as well with chairs and maybe you know maybe just have three chairs so that if there is a person with a wheelchair they can join in the conversation as well. Sandy: 20:05 But that way if a person is using a walker as an example they still feel comfortable and able to sit at the cocktail table rather than attempting to stand for a long period of time at a high cocktail table with the rest of the group. They can be joined down at their level. Anything to add Christy? Christy: 20:24 No you covered it very well. Marjorie: 20:26 OK. Let's say we're having an outdoor event maybe a picnic type of thing and we've got a single speaker as our P.A. system because we're nonprofits and you know we begged and borrowed that from our Program director's kid who's in a band. And so what what should we be doing if we know that perhaps it is volunteer appreciation and we know that a couple of our volunteers use hearing aids. But we know from interactions with them that they do not hear well. What should we be doing and thinking about that situation. Christy: 21:06 You actually dealt with a lot of this stuff. Sandy: 21:09 So first of all, if you know the person, ask them what would be most beneficial for them. Say "You know this is our situation, we want to make sure you're included." Perhaps it's making sure that the table they sit at is the closest to speaker, perhaps it's taking that script of what you are going to say and printing it for them so they can read along. As someone is talking perhaps you know I know there is technology to have an audio like descriptive listening device if you know that works for people who are low hearing as well not just for people who are blind or visually impaired. You want to give them that option. If that's an option due to costs see if it helps to have someone there live talking, helping them understand anything that they may miss. Marjorie: 22:02 Excellent. OK so let's say that part of our mission is to have a a movie that we screened together maybe they're educational of some kind. Each week or monthly. And one of our participants is has low vision. But next month we're going to do a silent film. What do we do? Christy: 22:29 That's a tough one. So what I would probably suggest in that case is to think about probably looking through the movie itself and putting a transcript together of what is happening within the film and doing that ahead of time. And number one you could email that to a person electronically and then they could actually bring that with them on say their phone. And so like technology is the best thing for people who are blind or visually impaired. And you know they could use their phone and put their ear buds into their phone and then hear that description of it using like their voiceover mechanism on their phone or whatever the Android version is. So that be my suggestion on something that you could do for the silent piece because you have to give them descriptions of what's going on because they can be sitting in a room with all the silence going on and people are cracking up laughing at something and they have no idea what it is. So you know a lot of times people always say, do people who are blind or visually impaired go to a movies? And my responses is Yeah! But I might also ask you what's going on during a fight scene or you know during something else where I'm not quite picking up the actions of what's happening. And oftentimes that's usually how we accommodate that for ourselves just asking someone who's with us. So that would be my suggestion is looking at it in sort of making a transcript and then emailing that to the person and that way the person can use our phone with their voiceover. And if they themselves don't have a phone, let's say you have someone who just doesn't have a smartphone yet then maybe you can put that onto a device of your own and then allow them to use that during the film. Christy: 25:08 It's fantastic because it used to be that you know in St. Louis, anyway it was basically the Muny and nobody else really did a whole lot of audio description until you guys kind of took it on and now it's just spreading in St. Louis which is fantastic. Marjorie: 25:24 We like that that's that's the that's real job time. So OK we'll do one more. What about if we know that we've got to say it's a sporting event and we know that one of our participants is in a wheelchair. Let's say it's baseball because otherwise it could be anything. Can we accommodate that person can we have that person play on the team. And if so how. Sandy: 25:55 So we're talking about playing on the team now not spectating. Marjorie: 25:59 They want to play. OK. Maybe it's like your community. Sandy: 26:03 So this is not one that I personally have experienced to tell you the truth. I know that there are a lot of adaptive sports available as far, as playing on a community team I guess it depends you know what the rules are. There's nowhere in the rules that says a person who is using a mobility device can't play then you you include a lot of times a person who wants to play a sport has the ability to do so. Sandy: 26:31 And this is one of those like general teachable moments if you will, people with disabilities can do a lot of things. They can do anything. Right? Give them a moment. They might do it differently than you would, but they can do it. And so if a person is wanting to play, they probably are able to. And it maybe that they wheel their wheelchair around the bases instead of running around the bases or however it happens to work out. But if it's allowable in your specific league, then go for it. Let them join in and listen to what they're saying if they're saying yes I can run around these bases and let them run around the bases. Marjorie: 27:15 Excellent. I love that answer because that goes to just asking people, "How do you think we should do that?" Christy: 27:26 That's absolutely it is. I was in a meeting earlier today and we were having a conversation. And I was being told that you know this person could not use the accommodation that they had available to them. And I said so did the person who said they couldn't use it because it was not the person with a disability who said they could use it. So did they ask that person? And they looked at me and said I don't think so. And I said well you know that's not necessarily as you as the organization is not necessarily on you would be the leader of the group that needed to ask. I said but the reality is they probably didn't because they didn't know how or they were too afraid. So then you totally changed everything because you didn't think that person could use an accommodation. But they weren't asked. And so it's those kind of things like Sandy saying you have no idea what the abilities are of a person with a disability and how you actually communicate and you actually engage in talk to them about the accommodation that they need. Sandy: 28:58 This is also a community league. So you're there to have fun and just enjoy the games, relax a little bit. Sandy: 29:07 But you know that's that's a good. And for anyone you know when you're out in the community if you encounter personal the disability your instinct is often to run up and help them do whatever it is they're doing. It's not necessary. You are you know it is your your free will to walk up and say hey can I help you with something? And if that person says no that's fine. Respectfully walk away. It's kind of the same concept for for any kind of an accommodation that they may need as well. Listening to what it is that they needrather than what you think they need. Christy: 29:40 And I often like to say I use it as almost the offering assistance equation. So I say it seems very simple but it's stop, ask, and listen. Stop take a moment ask how can I help you? Is there anything I can do to help you? And don't forget to listen, because sometimes what happens is people will ask and then they'll sort of jump in and do with what is believed to be what needs to be done. And it might actually be harmful to the person or to the individual and or they may not want to help at all. So listening to the response is as important as asking the question and that is really good rule. Marjorie: 30:22 One last question I have. Can I pet the guide dogs? Christy: 30:26 No ask first ask first ask first. Sandy: 30:32 We do have a couple of people in our office who use service animals, either seeing eye dog or or another kind of assistance. And you know the general rule of thumb, it's a dog, everyone wants a pet it. Now I understand I love my dog. It's great. But that dog is doing a job. Sandy: 30:50 So you know if you distract the dog you could be putting the person who's using the services of those dogs in harm's way or risk or something. Those dogs don't just work. They get time to play but they get time to run around and interact and. Be just like your pet at home. But when they've got either a harness on or a bandana or some kind of indication that they are working you can ask but you'll probably be told no. And then just say OK thank you and let it be because that dog is doing a job. Marjorie: 32:35 That's really good to know because I feel like that is an area that people really get confused about as you know this person wants to bring their Chihuahua in and I let them they're saying it's a service animal. And I think some people abuse the law and it hurts those that actually have well trained service animals. Sandy: 32:53 if it's you know is important to note that service animals do a whole lot of different things and they're not just use for people who are blind or low vision as an animal to assist with sight. There are lots of different uses for service dogs. They can they can help with opening doors that can help with picking things up. They can help you know some people who have seizures have dogs who can help identify when a seizure is coming. So there are a lot of different things that a service dog can do. They are not all golden retrievers, so it is possible for a small dog to also be a service dog. So just throwing that up because a lot of people again have that same misconception that they're not on a seeing eye dog harness they must not be an actual service dog. Christy: 33:38 And the other thing they're probably two things that I would love to add to this before we finish which is the first, a lot of people think that if someone is using a service dog and they don't look like they have a disability that must not be a service animal. That's not true. Service animals are being used for so many more things than just guide dogs as we're used to seeing. The other thing I would say to sort of add to what Sandy was saying about you know even little dogs can be service animals. One of my mentors has brittle bone disease. And she also is hard of hearing and she has a hearing dog and her dog is very very small because she has brittle bone disease so she couldn't have a big Labrador retriever that if she's in a hotel room trying to wake her up if there's a smoke alarm or something like that so it's a very small dog. And so there were even a lot of people asking me when we met her the first time. What does that dog do. It's very small. It doesn't look like a service animal. And so I explained what the dog does and why it's small because of her disability. And so you just never know. You know what that dog is what it's been trained to do. What it's a service animal for. And just because it doesn't look like a service animal doesn't mean it's not in just because someone doesn't look like they have a disability doesn't mean the dog they have with them is just their pet. Marjorie: 35:07 Oh man we didn't even get into invisible disabilities. I'm going to have to have you guys back! Well I do appreciate it, but we're out of time but I appreciate you guys coming. Sandy really quickly, how can we get ahold of you if we need to catch up with you. Sandy: 35:21 You can e-mail me my email is sjones@paraquad.org happy to answer any kind of questions or help direct you to someone else who might have a little bit better knowledge than me. Marjorie: 35:33 Excellent. Christy how about you. Christy: 35:33 You can also e-mail me at cherzing@paraquad.org. And we are always happy to answer your questions and do anything that we can to make everything more inclusive and more accessible for people with disabilities. Marjorie: 35:49 Thank you both so much. Thank you. Marjorie: 35:51 And thank you to all of you for joining us on 501Crossroads. 501Crossroads is recorded at the studios of MindsEye Radio is produced and hosted by me, Marjorie Moore. Mike Curtis is our sound engineer. Please go to iTunes or Stitcher or your favorite app and subscribe and leave us some feedback so others can find us. You can find us on Facebook at 501Crossroads. Thank you for listening. And remember we're all working towards the same outcomes. What nonprofits say: The media is big and scary, they don't have time for my little thing. What the media says: We want to help! Building a relationship with your local TV stations, radio stations, and newspapers doesn't have to be rocket science, but you don't have to be a stalker either. All it takes is getting to know what journalists and hosts need to do their jobs so they can help promote you! What's a PSA? Should I have a volunteer record a spot and send it to everyone? Who should I send things to? Wait, what's a media sponsorship... are they going to give us money? Elaine McNamara from 97.5 FM The Rock in Carlyle, Illinois is here to answer all of your questions about cozying up to local media. You can find the Rock on your dial at 97.5 FM near Carlyle or at www.wdljfm.com, on TuneIn, and on Facebook. If you're in the area and want to submit something about your organizition, send it to community@wdljfm.com. You connect with Elaine at elaine@wdljfm.com or find her on Facebook, Twitter, or LinkedIn. Yep, it's that time of year. 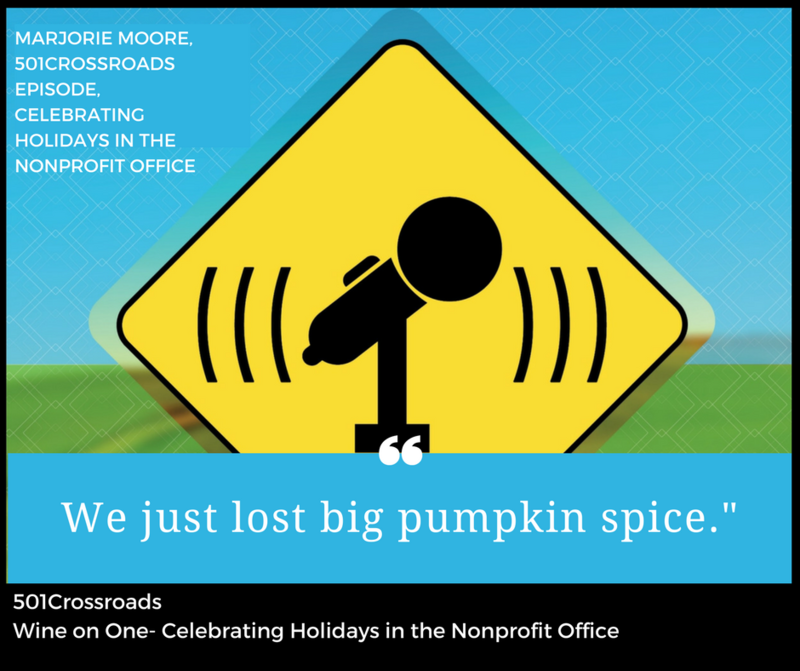 Now that it's officially ok to put a pumpkin spice shot of rum in your pumpkin spice latte, it's also time to plan the office holiday party, figure out year end donor stewardship, send the holiday card, and figure out who has to work the week between Christmas and New Years. Do you make that holiday card a donor ask? Can the homeless shelter close on Christmas? Do you let your Jewish staff members take off their holidays instead of the Christian holidays listed in your employee manual? Marjorie and Natalie grab a bottle of wine and tackle all of your impending holiday problems for you. For more on holidays, back at What's All this Talk about Unlimited PTO?, Legit Thanks, and Gift Giving in the Nonprofit Office.